Robert Kindler's "2BG2FAIL" License Plate Changed To "MNA GUY"
In his book, "Too Big to Fail", the New York Times scribe Andrew Ross Sorkin included a photo of a banker's license plate he saw in Greenwich, CT that read "2BG2FAIL". who seems to share the dry wit of his brother, the comedian Andy Kindler, said he bought the plate for a laugh as a reminder that "no one is too big to fail." But Kindler has since replaced the plates on his Porsche Cayenne Turbo. 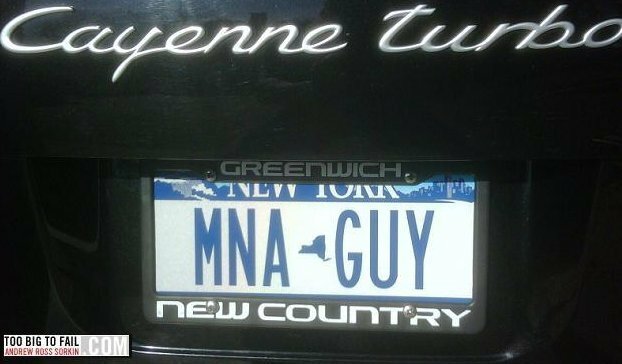 The new, toned-down one says simply "MNA GUY." Check it out -- and check out Sorkin's original post here.